You used to use the Windows Start menu. But it soon became unwieldy as you added more and more applications to your system. Then you started dropping shortcuts onto your desktop -- but eventually your desktop became cluttered and unmanageable. What's the solution? How can you get to your most frequently used items quickly? 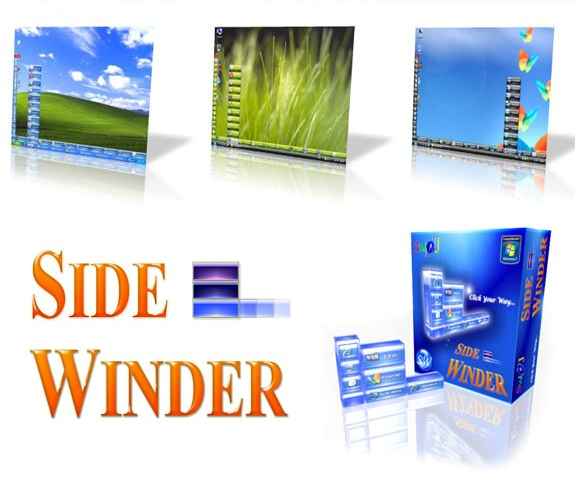 SWiJ SideWinder Quick Launcher is a Windows utility that lets you easily launch applications, websites, shortcuts, folders, documents, and multimedia files with just a click. You can even use SWiJ SideWinder Quick Launcher to store often-used text snippets, such as email addresses, for easy access! You know all of those functions that you need, but don't necessarily need to see all of the time? Stuff like Show Desktop, Shutdown, Restart, and the like? Well, SWiJ SideWinder Quick Launcher gives you a quick access side bar that has all of those buttons and more! There when you need it, hidden when you don't. You would think that a utility that gives you quick-launch access would be limited in scope, but not with SWiJ SideWinder Quick Launcher! When you hover your mouse over the app, you're immediately presented with 10 category slots! 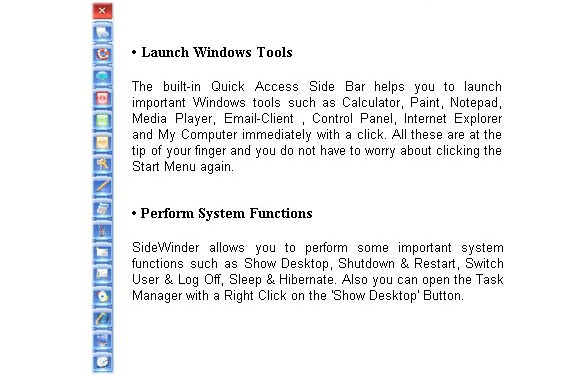 If you need more, SWiJ SideWinder Quick Launcher can comfortably handle 100 categories in 10 pages with up to 150 Buttons per category. Combined with subpages, you can rock out with a maximum of 15,000 quick launch buttons at once! 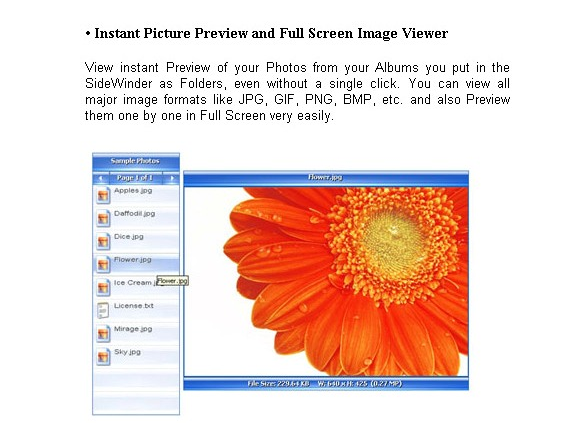 With SWiJ SideWinder Quick Launcher, you'll also enjoy some cool features that are ready to enjoy right out of the box. Web Search Tool, Website Navigation & Instant Translator, Note Tool, Dictionary & Translator, Currency Converter, My PC Tool, and more, are right at your fingertips! 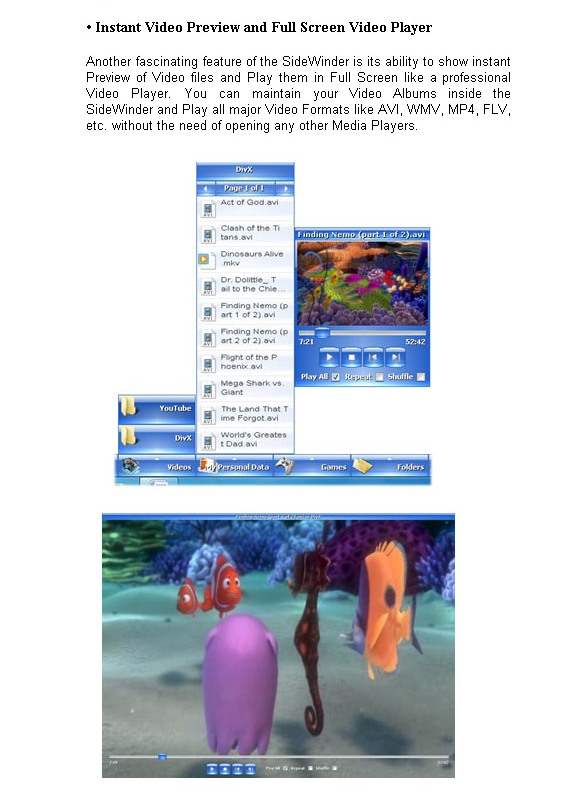 Plus, you can preview media files without clicking on anything! 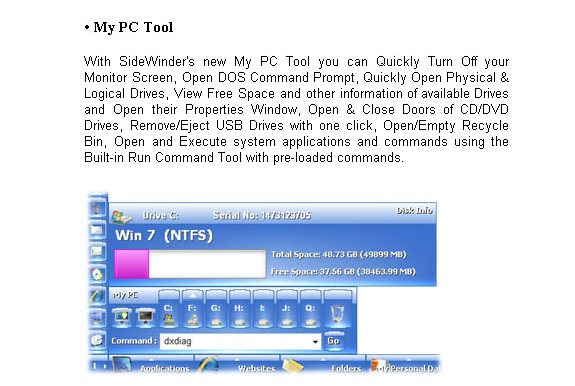 You'll experience an immediate boost in productivity with SWiJ SideWinder Quick Launcher! Say goodbye to hunting for icons or tunneling through unending cascades of Start menu items! 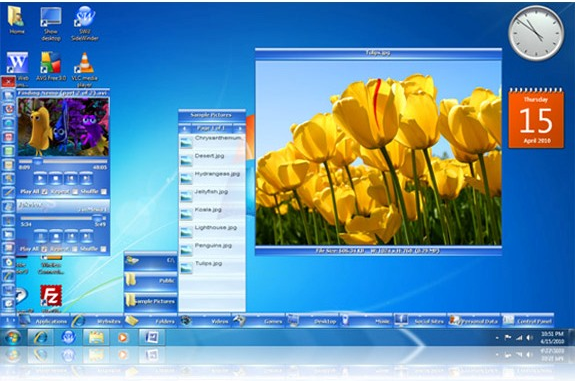 Quickly launch applications, websites, shortcuts, folders, documents, and multimedia files with just a click. Expand the number of quick launch buttons to match your growing needs. Clean up your desktop; achieve better PC performance and quick startup! 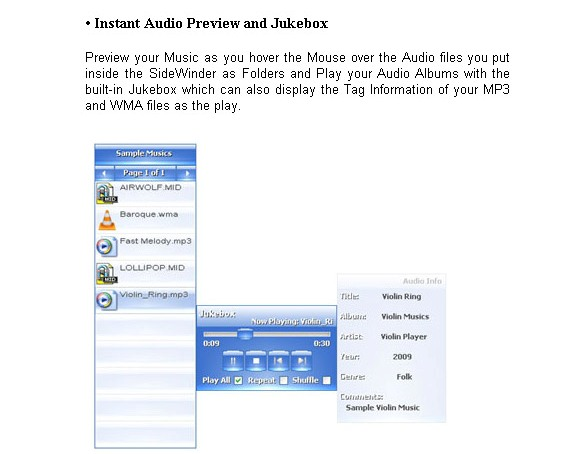 Group and arrange your favorite music files according to their Albums, Genre, Author, etc., and play them instantly. Put your entire video collection and even links to your favorite videos from sites like YouTube into one location and play them whenever you like. Select and organize your Pictures according to their Albums and keep them neatly in a single category or multiple categories. Have immediate access to Internal & External Hard Drives, USB Pen Drives, Camera Folders and other Removable Media whenever they're available on your PC. 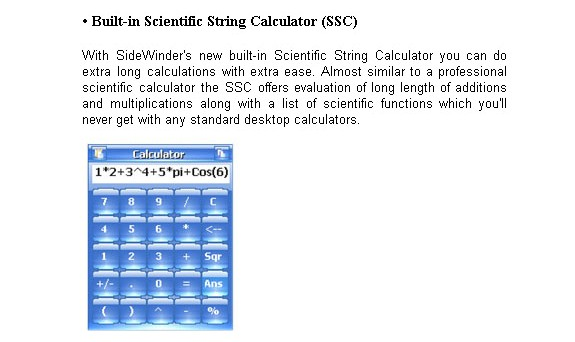 Use the built-in scientific string calculator to perform long and tedious calculations very easily. 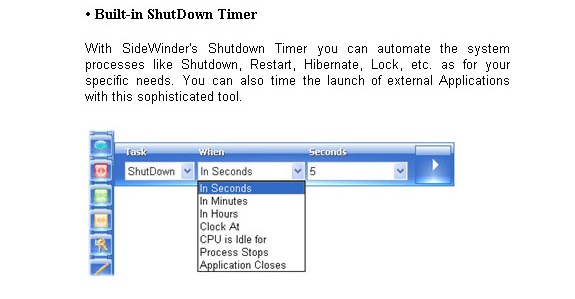 Automate windows shutdown and restart processes with the built-in shutdown timer. Rapidly switch between opened windows using the Switch Windows Utility. After you purchase SWiJ SideWinder it may be used indefinitely. 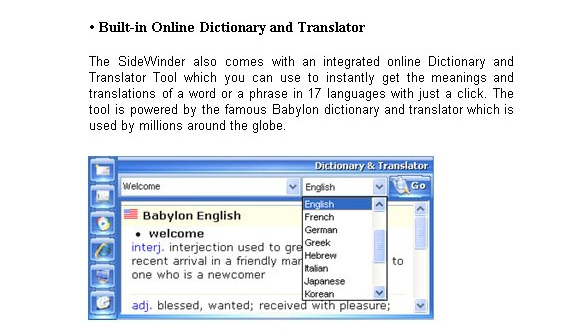 SWiJ SideWinder is licensed per computer, and not per user. eb235 I guess we're going to hear the same old tune about the special prices... in 2019 ! Let me quote Gary Smith (back in December 2016) "I see the Home Edition for $19.95 offered on the developer's website as well, and it also has a 1700+ icon pack added with the special offer.[...] If the Bitsdujour offer is really a special price, then it should also offer the 1700+ icon pack, AND have a lower price than the $19.95." And let me quote Walter Jayanth the developer answering a few hours later "The Special Offer on our home page is an outdated one. And the price is actually $29.95 for the Home Licence package." Now if you're browsing http://www.swij.com/sidew...uynow.html and click on the "time limited offer" to get to https://sites.fastspring....ecialoffer you'll have the opportunity to buy the offer mentioned by Gary. I stopped checking at that point but this left me uneasy. Are we struck with a recurring lack of luck ? Meaning that whenever there's a BDJ offer, there was just before a better offer on the developer's site but he forgot to end his offer ? Or the developer has forgotten for more than two years to update his web site ? I don't mean to be harsh to the dev but buying on the Internet, especially software, is mainly a matter of trust. If there are facts you don't understand, you're not encouraged to have trust. So I think a clarification would be in order. Thank you. Bill Sech I installed and was testing this program. Eventually, I clicked on the Application button down near the left bottom there (the one that opens a bar where icons can be drag and dropped) and instantly my todo list program (Swift To Do List 11 Evaluation which was open and minimized) came up and something selected all the tasks in view and marked them complete. I was able to reproduce this behavior a few more times in exactly the same manner. So I uninstalled sidewinder and will not use it. John Moverley I purchased this software and was sent two activation codes in separate e-mails both with the same order number. "your license has been revoked successfully!" Amit I did run it but its not appearing when launched. Its not showing up on the screen anywhere. I also ended it in task manager and relaunched from start menu but it just doesnt appear. Where can I find the bottom bar and sidebar ? Adi Abir I've downloaded the demo, purchased the product, received the activation code and entered it in the program. I received the error message 'Your License has been Revoked Successfully!'. Never saw such an error message before? What do I do now? The product keeps insisting that it's not activated. HJ B Yesterday, I posted a comment showing that I checked the developer's website and found that, as noted by eb235, had been the case in 2016, the Developer was STILL charging more on BDJ than was being charged on the developer's website for the "home license. ($19.95, as opposed to $23.97). I provided a link to the page of the developer's site at which that lower offer was made. For some reason, my comment did not survive the BDJ filtering process. The new "home license) (3 licenses) price is now in accord with the claim of a 40% discount. In my view, when this sort of thing happens a posting about it should not be filtered out. It remains relevant that the new higher price schedule went into effect contemporaneously with the BDJ offer (or as was the case here, only after the offer was posted and a complaint was made). I trust the BDJ operator will not filter out this second message on the point. This is clearly not a "bad apple" posting. Constantin Florea @Adi Abir, I've just contacted the vendor regarding the issue you mentioned. Walter Jayanth Apologies to all for who had issues with SideWinder activation. We request you to try the activation again with your Activation Codes. Also, we're unable to reproduce any other issues mentioned here other than the Nip get hidden by certain full screen tasks in Windows 10. 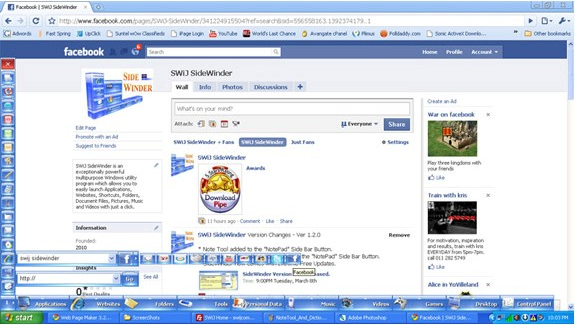 Please note the current SideWinder is released prior to the latest Windows and we have not updated the software or website since 2010. Garrett Goyette @Amit check lower left hand corner above task bar for a tiny white arrow in a blue rectangle to expand the app. Adi Abir I couldn't activate the application. You 'requested' that we try the activation again. Tried it. Didn't work. If 'the current SideWinder is released prior to the latest Windows and we have not updated the software or website since 2010' why do you charge people for a program that you have not tested for the latest versions of Windows? Please make sure that my activation code will actually activate the program or else, refund the $11.97 you charged me. Constantin Florea @Adi Abir, I've just contacted the vendor regarding the issue you mention. John Moverley I agree with Adi Abir. I have been using BitsduJour for many years and have received many good bargains. However, I am very disappointed that BitsduJour would feature a program that seems unsupported, the installation code does not work and that the company does not answer e-mails sent to the support team. Awesome Automated Reminders and Task Scheduling!